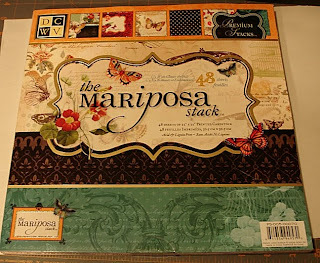 If you haven't purchased the Mariposa Paper Stack in 12x12 by DCWV now is your chance to win it. I was lucky enough to get my hands on a couple packs of this yummy paper. It is so beautiful. Loaded with foils, glitter and so much more. To enter the giveaway comment this post (become a follower as well if you want) and leave your email address for contacting you. USA or International can enter. Thanks for the chance to win the mariposa stack.It's beautiful!!!!! Welcome in blogger world and thank you so much for the change to win the paper stack. It hasn't arived in the netherlands yet so I aam hoping to get lucky. Wow I'd love to win this as I don't think it has arrived in the UK yet! So sweet of you and the paper's are pretty sweet tooooo!!! How sweet what a great giveaway!! I've been eyeing this paper lol. Its soo pretty! beutifull paper collection from DCWV , thanks for the opportunity!!!! Thankyou for the chance to win, this paper is gorgeous! Thanks so much for the chance to win! I love this paper pack. Your blog looks great, I just set up one as well. Thanks for the chance to win! The paper is gorgeous and I love the stuff you've done with it. Wow I love this paper pack and my Joann's is always out when I go there. Thanks for the opportunity to win. My e-mail is tracymccarty1@gmail.com Good luck everyone. This paper stack is soooo pretty! I am happy you shared your blog and to be following now! My email is j_olaughlin@yahoo.com or you can find me on the scrapbeach!! Thanks for such a sweet giveaway!! I have not seen this paper pack at any of my local stores. It is very lovely. This paper is just sooooooooo pretty!! Wow, lucky girl,I wish I was someplace close so I could go and buy my own. Thanks for the chance to win! Welcome to the beach and good luck with your blog. Also, welcome to the world of crafting - let's play! i hope you get to meet a lot of talented people here i'll follow you blog...thanks again. This is a beautiful paper pack. I'd love to win it. Thanks for the chance to win. Oh how awesome of you to do this giveaway I have been looking around for this paper packet to no avail. thanks for the chance. Awesome give away I so want that pack my joanns doesnt have it. Thank you for doing this super nice of you. I also became a follower. Hi, I found you through Life on the (scrap) Beach. I'd love to enter your contest. This paper is beautiful! My Joann's is too far away for me to travel to. Fingers crossed! Wellcome to the bloger world,thanks for the chance to win!! Wow! This is a great giveaway! Especially since it is so hard to purchase right now...lol! Congrats on the blog! Can't wait to see who wins! Wow Super cool Giveaway! Gorgeous Paper stack! If you draw my name you can find me on the beach or my blog. Thanks again! Would love to be a winner! :) Thanks for the chance!